Pope Francis asked 45000 children preparing for confirmation to promise Jesus they would never engage in bullying. Turning stern during a lively and laughter-filled encounter, Pope Francis told the youngsters he was very worried about the growing phenomenon of bullying. He asked them to be silent and reflect on if there were times when they made fun of someone for how they looked or behaved. And, as a condition of their confirmation, he made them promise Jesus that they would never tease or bully anyone. The pope ended his daylong visit to Milan by participating in an expanded version of the archdiocese’s annual encounter for pre-teens preparing for confirmation. An estimated 78000 people filled the city’s famed San Siro soccer stadium; the archdiocese expects to confirm about 45000 young people this year. His grandmothers and his mother, the pope said, were the ones who taught him to pray. Playing with friends taught him joy and how to get along with others, which is part of faith, the pope said. And going to Mass and to the parish oratory also strengthened his faith because “being with others is important”. 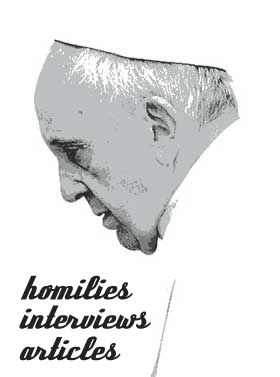 Parents asked the pope’s advice on educating children in the faith.